When it comes to building a swimming pool, the best advice you’ll receive is to work with what you’ve got. While you certainly can’t alter the characteristics of your yard, there are certain steps that will ensure you start the planning process with the right expectations. Here are the top five ways to make your yard pool-ready. Is your yard relatively flat? The more level your ground, the more options you’ll have in terms of the pool’s size and shape. Flat yards are also ideal for homeowners on a budget, as they reduce the need for retaining walls. If the yard slopes, construction becomes a challenge because the contractor must account for multi-level installation—not to mention additional construction materials and the accessibility of heavy machinery. Chances are you haven’t thought about what’s underneath all that soil, right? Sure, you can account for the removal of sod, gravel, trees, and shrubs, but until you start digging, you may not know the whole story. Talk to neighbors who’ve gone through the process of building a pool. Did they have to blast through large rock or concrete? Did they face added excavation costs they didn’t anticipate? Have a realistic idea of the desired pool size before you even pick up the phone for estimates. Many people mistakenly overestimate the size of their yard. Try to be as accurate as possible. Determine what extra features you want, how much concrete you might need as a border, and where the fence will be erected. Builders can guide you in the process, but it’s helpful to have an understanding of the landscape in relation to size and shape as you prepare. Unless you have an oversize backyard with the choice of precisely where the pool will go, you may be stuck in terms of the elements and how they affect water level and overall comfort. If you have large shrubs or trees, you’ll likely have a naturally shaded pool. Desert landscaping? You’ll probably be in direct sunlight, which is great for taking advantage of natural energy and warmth but causes accelerated evaporation. Think of the financial implications: Will heavy winds necessitate constant cleaning? Will seasonal storms require you to build a retaining wall to prevent flooding? Ask yourself how you want your outdoor space to look and feel. Many homeowners choose to completely transform their yards after building a pool. As you’re budgeting for extras such as lighting, safety equipment, or a hot tub, consider the costs for decorative tile work, tropical plants, and patio furniture. You may find you need to remove more land than you originally thought. No question is too silly for a builder. 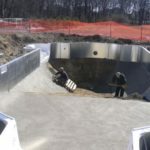 Do your research and consider all angles of pool construction from the initial development stages to the mature years. If you think building a pool will be too troublesome given the existing layout, you might be surprised. Professionals hold that title for a reason and can likely offer solutions to help your dream come to life.